The DANA Cultural Center provides a unique destination to understand life in the California Rancho Era and to discover the stories of those who left their footprints on the land throughout time. The Dana Adobe, and the 130 acres of preserved land, engage the visitor in the site’s ecological and cultural history and reveals how actions over time shape our future. 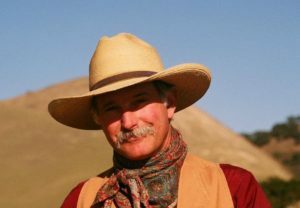 Dave Stamey is one of the most popular Western entertainers working today. He has been voted six times Entertainer of the Year, six times Male Performer of the Year, and five times Songwriter of the Year by the Western Music Association, and received the Will Rogers Award from the Academy of Western Artists. He’s delighted audiences in twenty three states, and finds that he prefers this to being stomped by angry horses. A song about Captain Dana, the adobe and the pepper trees. Toda via estoy aqui!